Just two years after Guvernment Nightclub said its fairwell, the Hoxton hosts its last No Neon event that same weekend in January. 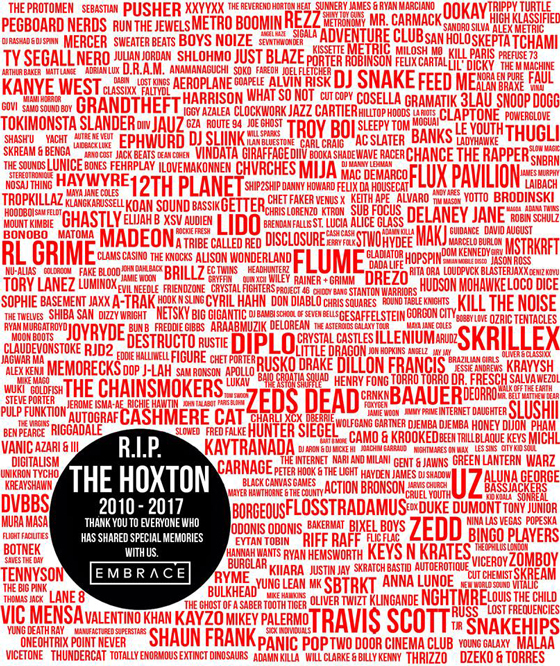 Since 2010 the Hoxton has brought so many talented acts to Toronto’s fashion district. We are saying goodbye to the venue, but Embrace Presents will be moving their events to CODA, The Velvet Underground, Maison Mercer, and the Danforth Music Hall. The music lives on! Although goodbyes are hard, we at Euphoradio are thankful for all the events we’ve been able to cover for the blog, and enjoy at our leisure. Some of our fondest memories in Toronto’s rave culture started at the Hoxton, and some of our personal milestones were shared there too. So here are some of the best moments our blog has caught at The Hoxton. RIP and remember – the music always lives on. If you would like to attend the last weekend of The Hoxton events, Deorro is playing on Friday January 27th, and Hunter Seigel is playing No Neon on January 28th.